In March 1931 the formation of EMI (Electric and Musical Industries Ltd) came about with the merger of the Columbia Graphophone Company and The Gramophone Company, with its now famous HMV record label. 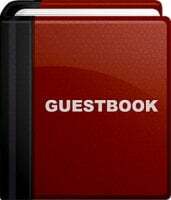 These companies have a history extending back to the origins of recorded sound and have been major players in the world of recorded church music, issuing more recordings than any other record company. 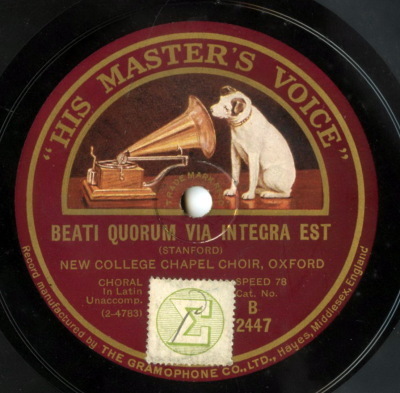 The first recording of an English choir was issued by 'The Gramophone Company' in 1902 even before the famous HMV trademark made its appearance. The Archive has many rare and historic records issued by The Gramophone Compan. 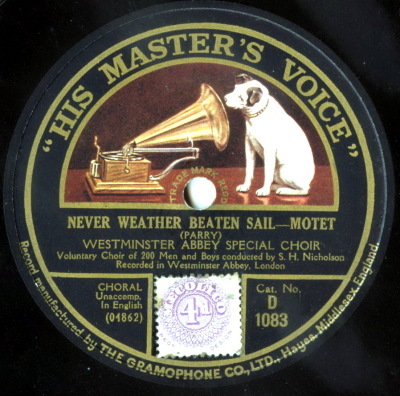 'Nipper', the little terrier immortalised in the famous 'His Master's Voice' trademark, takes Omnibus on a nostalgic journey from wax cylinder to compact disc to celebrate the centenary of the gramophone. First demonstrated by its inventor Emile Berliner in May 1888, the gramophone rapidly grew from a nursery toy to become an indispensable part of entertainment in the home. This was the Co-operative Society ('The Co-op') own record label and sold exclusively in their shops during the 1920s. They were pressed for the Co-op by the Vocalion Gramophone Company and duplicate exactly their own 8-inch 'Broadcast' records. 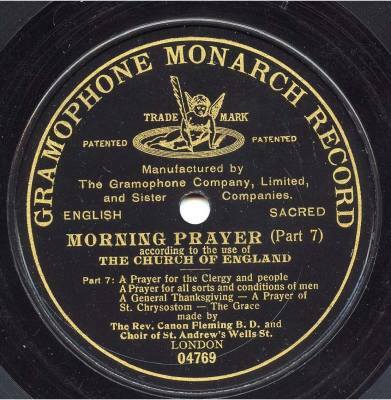 This is the only gramophone record in the Archive on the Unison label and is of Master Bobby Lemaire, Head Chorister of Clumber Park Choir School and subsequently St Nicolas College Chislehurst and was recorded in the summer of 1929. Originally issued as an 8-inch 'Broadcast' record, it proved so popular that Woolworth's had it pressed to their own Unison label. 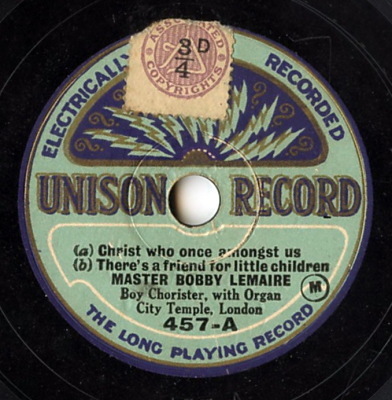 Click to play the gramophone record and to read much more about Bobby Lemaire. Click to discover the different types of recordings which give the Archive its unique breadth and scope.